Located in Newcomb, NY, Camp Santanoni is a popular site for visitors to explore and marvel at its impressive architecture. 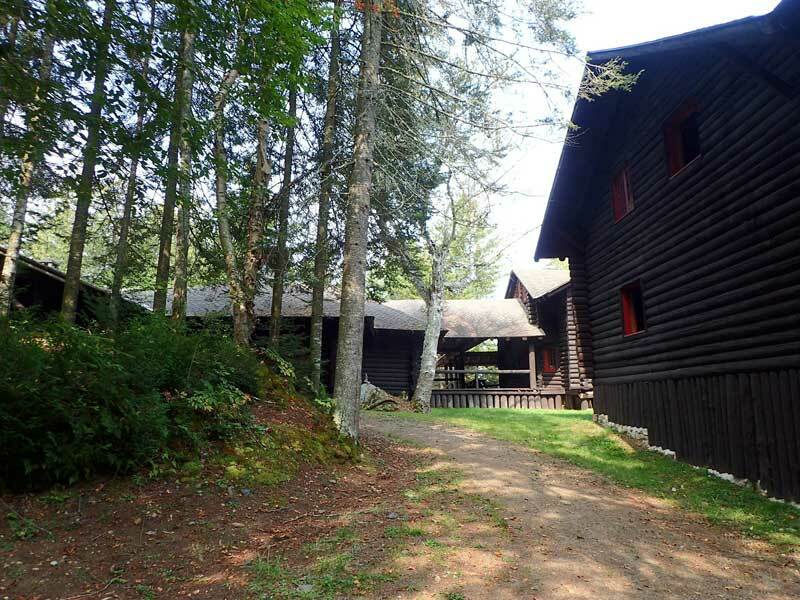 Built back in the late 19th century, Camp Santanoni is regarded as one of the grandest and most distinguished of the Adirondack Great Camps, and many of its historic buildings still stand today. The development of the Great Camps of the Adirondacks began in the mid-to-late 19th century. Many wealthy families in the U.S. were attracted to the idea of having a summer home away from the city and closer to natural surroundings (mountains, lakes, etc.). The first Great Camp was built by William West Durant - Camp Pine Knot in Raquette Lake. Camp Pine Knot featured many qualities that would appear in later camps, such as huge structures built out of logs and decorated with ornate designs. Everything was on a much grander scale, which is what made it a Great Camp. In the late 19th century, a new Great Camp would be developed in the Adirondacks - Camp Santanoni. The first owners were the Pruyn family, which included prominent Albany banker and businessman Robert C. Pruyn (1847-1934) and his wife Anna Pruyn (1853-1939). After purchasing about 12,500 acres of land in Newcomb, the family hired architect Robert H. Robertson to design and build an Adirondack camp. Interestingly, Camp Santanoni didn't turn out to be a traditional Great Camp. Although it does share similar structures as other camps, the overall design was inspired by Japanese culture. When Robert Pruyn was young, he lived with his father for a few years in Japan; his father was America's first foreign ambassador to Japan. During Pruyn's time in Japan, he grew to admire Japanese design and culture. When Robertson started to build Camp Santanoni, he did so with input from Pruyn. For Santanoni, Pruyn envisioned a camp that existed in harmony with its natural surroundings. Instead of a large group of buildings, the camp's structures were positioned throughout the property's landscape. The shape of the Main Lodge became that of a phoenix in flight, symbolizing transition. Named after the nearby Santanoni Peak, Robertson finished building most of the camp in 1892-93. Prominent architectural firm Delano and Aldrich built the artist's studio, the Gate Lodge, and the creamery. Edward Burnett helped design the operational layout of the Farm Complex. Located around the southern shore of Newcomb Lake, the Main Complex featured the Main Lodge and several other buildings. 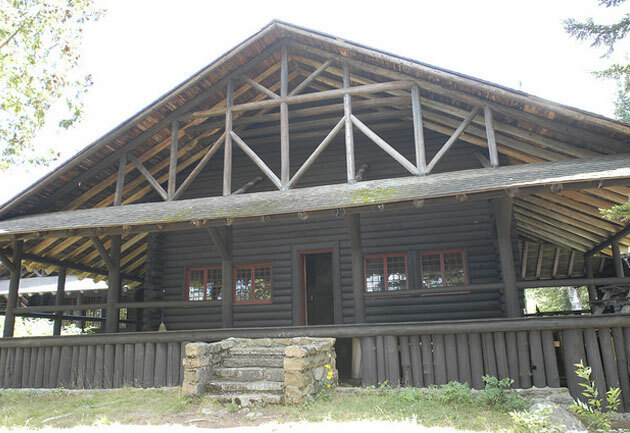 The Main Lodge had a living and dining building with two bedrooms, four sleeping cabins, and a kitchen and service building for staff; all of these buildings shared a connecting roof and porch. Other buildings in the Main Complex included the boathouse, artist's studio, and icehouse. Located 4.7 miles south of the Main Complex, the Gatehouse Complex was built at Lake Harris. Along with the Gate Lodge, which had a large stone arch and staff bedrooms, the Gatehouse Complex featured a caretaker's home, barns, wagon sheds, other buildings, and the trailhead to the Farm Complex and Main Complex. Located just north of the Gatehouse Complex, the Farm Complex was the camp's main source of food and produce. The complex included large barns (with cattle, sheep, goats, pigs, and more), four farmhouses, kennels, a stone creamery, and other buildings. The Pruyn family loved the outdoors, and although Camp Santanoni was built as a refuge from city life, they welcomed guests to stay and enjoy the property. One of their most well-known guests was Teddy Roosevelt. After both Robert and Anna had passed away, ownership of the property transferred to their children. Their heirs managed the camp for a while, but they decided to sell it in 1953 to the Melvin family. Crandall and Myron Melvin continued to use the camp as a retreat, but they also focused on preserving the buildings. Unfortunately, in 1971, a tragedy occurred at the camp when 8-year-old Douglas Legg disappeared. The boy was the grandson of Myron Melvin, and he disappeared during a hiking trip with his uncle at the camp. On one of the trails, the uncle noticed poison ivy and told Douglas to go back to the Main Lodge and change into pants. Although he passed his older brother and cousin near the Main Lodge, he then disappeared. After weeks of searching with no results, the State Police decided to end the search. There are several theories about what happened to him, but his disappearance remains a mystery. The Melvin family was devastated by Douglas' disappearance, and they soon sold Camp Santanoni to the Nature Conservancy. The Nature Conservancy then sold the property to New York State. The camp's lands were incorporated into the State Forest Preserve, but for two decades, Santanoni was left abandoned. Most of the buildings remained in good condition over the years, but in 1990, there was a new interest in preserving the camp. 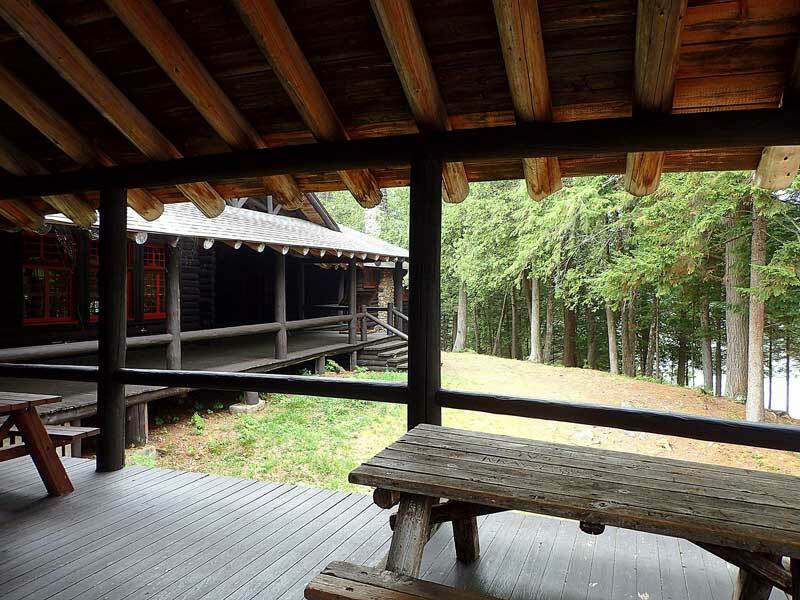 The Adirondack Architectural Heritage (AARCH), the Town of Newcomb, and the Preservation League of New York State all advocated for Camp Santanoni's preservation, and in 1992, New York State announced it would develop a management plan for the state-owned historic site. 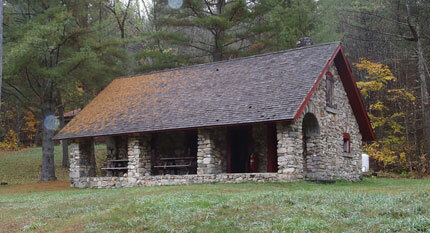 Currently, the camp has been maintained through the state's Camp Santanoni Historic Area Unit Management Plan. Some of Camp Santanoni's trails are open for recreational activities, including biking, hiking, cross-country skiing, snowshoeing, and horseback riding. There are also a few designated primitive camping sites that are open on a first-come first-served basis. The access point is at the Gate Lodge Parking Area located on Newcomb Lake Road. June - September: The AARCH offers monthly day-long tours of the camp for a suggested donation. There is an option to take the tour via horse-drawn wagon. Late June - Labor Day: The camp is staffed with interpreters who provide guided tours seven days a week. A lot of buildings are open to the public during this time, including many at the Gatehouse Complex, the Farm Complex, and the Main Complex (boathouse, ash house, bathhouse, gazebo, and most of the Main Lodge). 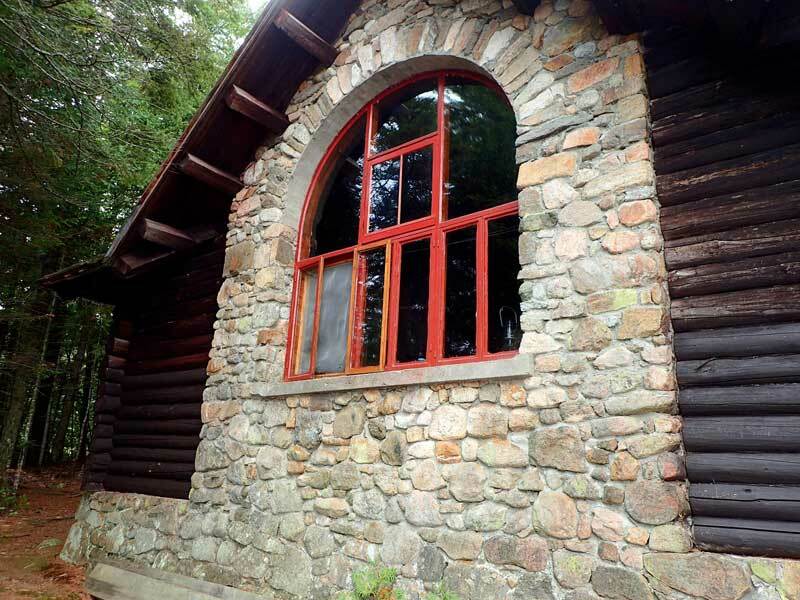 Labor Day - Fall Season: Roughly a half dozen of Camp Santanoni's buildings remain open for visitors. There are no scheduled tours during this time, and the camp isn't staffed. However, it is still open for visiting and exploring. Winter Months: The AARCH usually hosts three winter open house weekends at Camp Santanoni: the long weekend with the Martin Luther King holiday, the long weekend with the President's Day holiday, and the weekend closest to St. Patrick's Day. During these special weekends, participants can ski into the camp, hang out in the Artist's Studio, enjoy hot refreshments, and tour the camp. Spring - Beginning of June: Some of the buildings are open, such as the living room/dining room at the Main Lodge and the boathouse. The AARCH doesn't offer tours during this time, but some horse-drawn wagon tours are available if you check online. The preservation of Camp Santanoni is a work in progress, and if you'd like to help, then you can join the Friends of Camp Santanoni. This group provides financial support for the camp and works on volunteer projects. Thanks to Camp Santanoni's supporters, it still serves its original purpose as a place for visitors to escape to and enjoy the wilderness.